With news in the past week that Premier Sports TV have signed a five-year contract to broadcast all Australian rugby league in the UK (every NRL match of every round with at least six live games per week, State of Origin, Test matches, finals series, archive footage, plus a block on all streaming via betting sites), it's good news for Northern Hemisphere rugby league fans if you are prepared to subscribe to the extra channel. A shame it's not in HD in the UK though, but perhaps a deal like this gives them the leverage to do it in the near future. Then again, given the broadcast latency on Premier, we don't any more time added before they upgrade their signal. Australia has full coverage across Fox Sports and the Nine Network, but are restricted by that stupid betting in-play online restriction, and probably the same deal as previous years, delayed coverage on Friday night games. 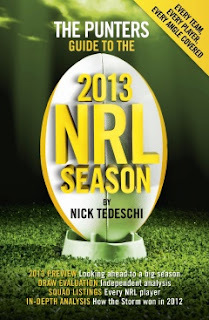 With all the latest information, including each team’s strongest line-up, a recruitment assessment, position ratings, coaching history, draw analysis and, most importantly, end of season predictions, The Punter’s Guide to the 2013 NRL Season has every part of the game covered—from a punter’s point of view. This is the ideal book if you want to take out first prize in the office tipping competition and win on the punt. 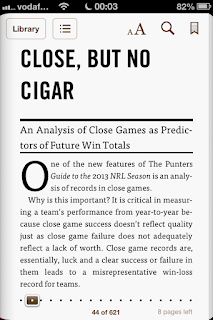 To buy the book, visit the Slattery Media website. Be warned though, postage prices from Australia are ridiculous (free within Aus)- the book costs $14.95, postage is a further $36!! Mind you, that's not a massive ask if you're staking $20. 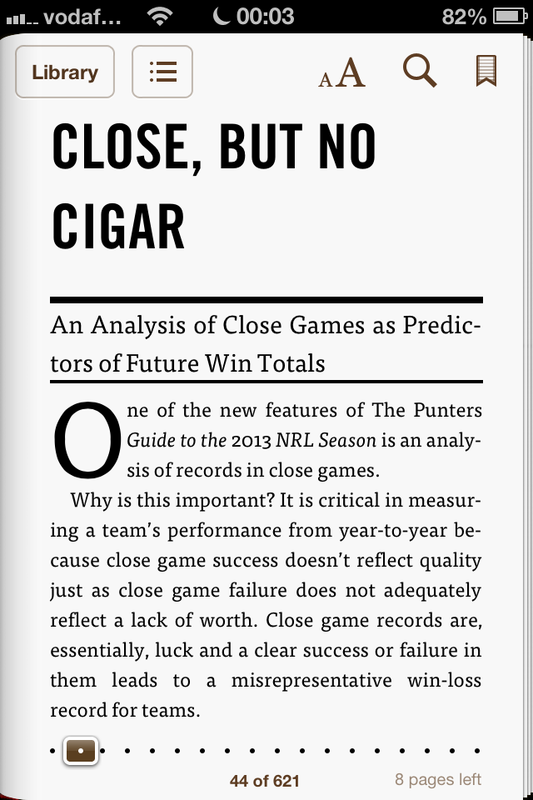 There is an alternative though for expat/foreign punters. The book is available on iTunes for use on iPads, iPhones etc via the iBooks application. I was hesitant about reading a chunky book on the iPhone, but it comes up pretty well.